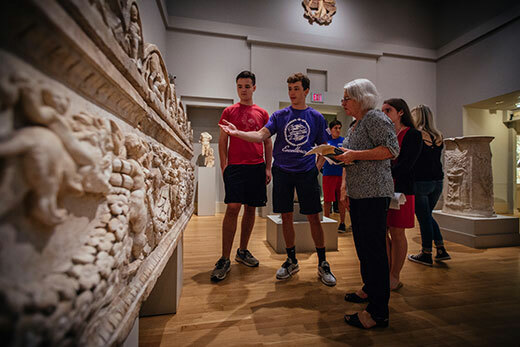 Moving beyond the traditional classroom, students in history professor Cynthia Patterson's first-year seminar learn about ancient Mediterranean culture by examining museum artifacts and weighing ethical questions about how they are obtained and displayed. Here, students (left to right) Jack Douglas and Will Arcara discuss an exhibit with Patterson. Teaching about the connections among the ancient cultures around the Mediterranean Sea can be an ambitious goal, but Emory College history professor Cynthia Patterson has a secret weapon. Steps away from the classroom where Patterson teaches her first-year seminar sits the Michael C. Carlos Museum. As the title of the course — “Exploring the Ancient Mediterranean Through the Carlos Museum" — makes clear, Patterson makes use of the artifacts there to help convey that world through art, literature and history in a way that lecture alone simply cannot. The Ancient Mediterranean Studies program, which Patterson directs, already relies on an interdisciplinary framework to help students understand the legacies of the ancient Greek, Roman, Egyptian and Near Eastern cultures. Patterson is especially passionate about the study, challenging the notion that the Western culture we know today began with the laws and society of ancient Greece. Her students, she says, learn about Near Eastern influences on Greece, as well as about conflict and both the Persian and Roman empires in the Mediterranean world. That opens the door to later conversations about how museums such as the Carlos have acquired their collections and ethical questions about properly displaying pieces for public education or enjoyment. Sophomore Andrew Hoover, a neuroscience and behavioral biology major, took Patterson’s class last year because he was into museums. He became so intrigued by the cultures and questions the seminar raised that he spent his summer delving into the Stuart A. Rose Manuscript, Archives and Rare Book Library for the travel diary and other papers of William Arthur Shelton. A professor in Emory's Candler School of Theology, Shelton traveled to the Near East between 1919 and 1920 to buy ancient artifacts for Emory. His acquisitions now form the core of a central Carlos Museum collection, including the oldest Egyptian mummy in the Americas. Hoover expected to find academic writings about Shelton’s travels. What he found was a professor who was captured and interrogated on his way to Aleppo — released only when the natives battling the British realized he was an American — and who traveled in a warlord’s armored car. “I was thinking this would be a mild-mannered Emory professor but he turned out to be a revolver-carrying Indiana Jones,” says Hoover, who turned his independent research into a website and interactive map that traces Shelton’s travels. “The knowledge I have about his artifacts came directly from conducting object history in Dr. Patterson’s class, just like I learned you can understand more than a blurb in a museum if you do the research,” Hoover adds. Learning to examine cultural antiquities can be intensely personal as well. Alex Kiritsy is in Patterson’s seminar now, not because it ties into her pre-med plans but because of her own heritage. Her paternal great-grandfather immigrated to Massachusetts from Delvinë, Albania, a town in the historically Greek region of Epirus. In wanting to know her family history, she wanted to study Greek history beyond her passing knowledge of mythology and the origins of democracy. For her class project, she plans to research a marble statue in the Carlos Museum collection, conjectured to be a muse and suggested to have originated in the Epirus region. Kiritsy already has learned that the head of the statue is constructed of a finer marble than the body. That indicates that the piece was created at different times by different craftsmen. But her true aim is to assist in determining the object's specific place of origin, something researchers have struggled to do, because differing regions lay claim to it.